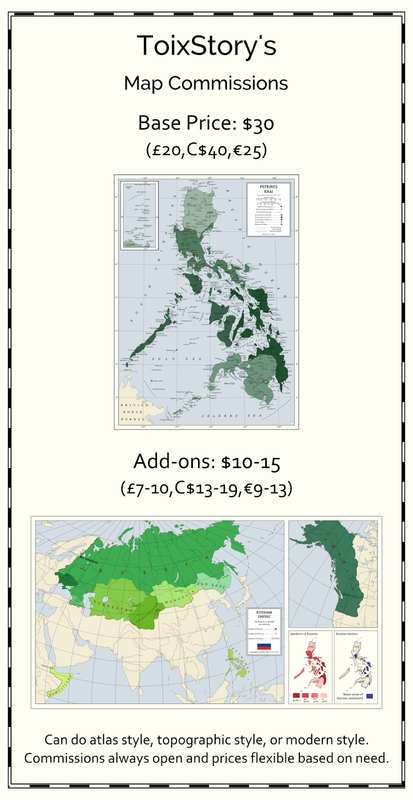 With a recent uptick in commissions, I decided to go ahead and update the previous commission post to a more official post on here regarding a guide towards commission pricing so that those seeking to commission a map from me can get a good idea of what they want. While the prices on the guide are a good starting point, they are flexible, and can be adjusted. Right click the image and open it in a new tab for full size. If you'd like a commission from me in the future, I'd recommend bookmarking this page as I will be updating the waiting list periodically.